Online Backup: we all know we need it, but there are so many options that it can be overwhelming! This post explains the best options for automatic, online backup storage services for families and personal use. Using a cloud backup for family photos gives you peace of mind that your memories will be safe, no matter what happens. You should be backing up your family photos and files in multiple places. I do recommend doing a regular backup to an external hard drive, as well as using syncing services like Dropbox for everyday sharing of files. Even if you backup to an external hard drive, you also need to have an “offsite backup” – meaning, your photos should be a different physical location, such as a family member’s house or the cloud. Storing something in “the cloud” is just putting your files on a company’s server that you can access over the internet. However, you also need to have an “offsite backup” – meaning, your files should be a different physical location. What if you lose your home in a flood, fire, or tornado? What if your computer or laptop is stolen? What if your child with computer privileges accidentally deletes something important? What if you get a virus that corrupts everything on your computer? All of these scenarios are unpredictable – and they happen more often than you think. Having multiple backups is awesome, but not if your computer and your hard drive are destroyed in the same situation or disaster. By far, the best way to get some peace of mind about your precious family photos & videos is to store at least one copy of everything in a different location. Technically, you could put a copy of your photos on a hard drive that you store at a friend or family member’s house – but then you have to deal with remembering to copy your photos over and transport it back and forth regularly. Your family photos and videos are irreplaceable, so you need something that happens easily and automatically. If it’s inconvenient for you to backup your files, then that’s not a reliable solution for the long-term! Instead, I highly recommend using a cloud backup service to do a general, automatic backup of everything on your computer – this will give you so much peace of mind! Backing up your files in “the cloud” is just putting a copy of your files on a branded server that you can access over the internet. Once you set it up, you won’t have to worry about your photos in a natural disaster because everything will already be backed up to a safe location. Moms and families usually just want to back up their personal computers: their family pictures, videos, files, and memories. There are TONS of options out there for backing up your files. However, so many of them cater to businesses that it can be hard to find backup solutions that truly shine for personal, home, and individual use. 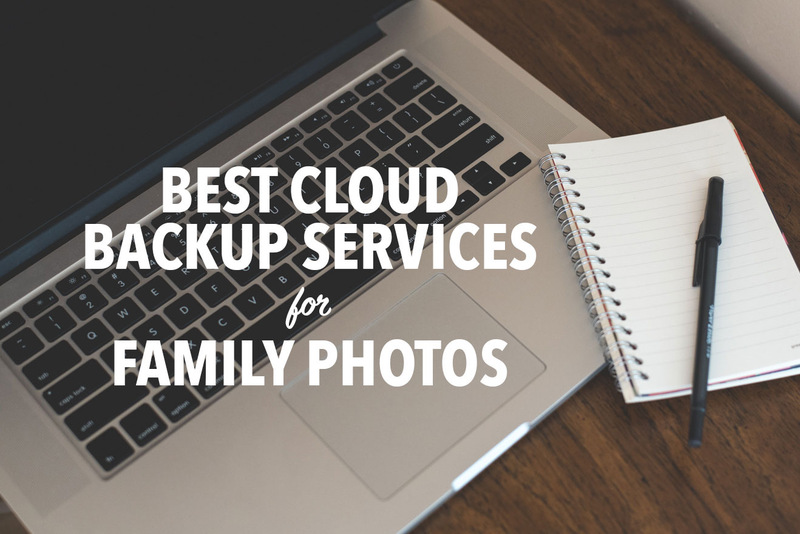 My general criteria for a good backup for family photos is that it needed to be affordable, encrypted/secure, offer automatic/scheduled backups, and be available for Mac and PC. It’s also nice to have several ways to access files and restore them. 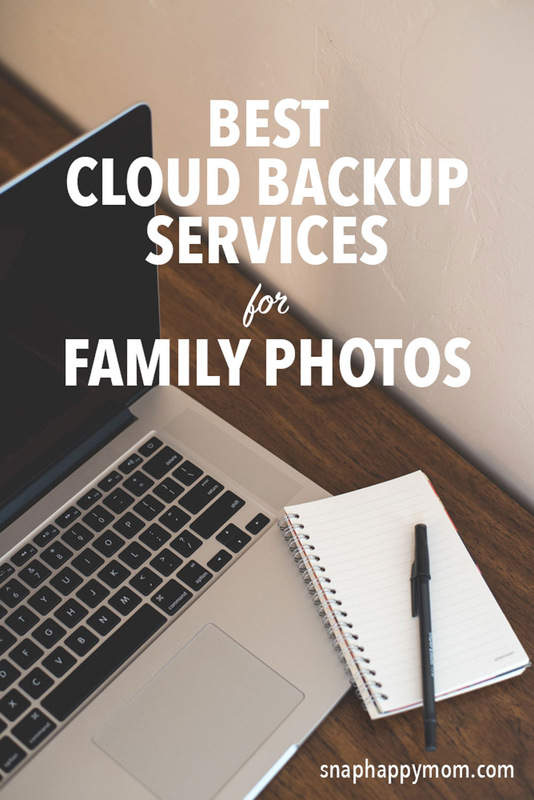 This post lists my top three favorite options for automatic, cloud-based backups for families that just want their photos backed up! This post includes affiliate links. Thanks for supporting Snap Happy Mom. My #1 suggestion is to go with Backblaze for cloud backup. My family has been using it for years, and I love it! Backblaze is definitely the simplest option out there for online backup services- there’s a reason it has such a large user base! Some of the other options on this list are a lot more complicated, but Backblaze is a solid option if you are overwhelmed by all the techy words people use to talk about backup systems. In layman’s terms, you set Backblaze up and it quietly copies your files without affecting your computer speed. You can access those files through the web or their app. If your computer completely dies, you can restore those files online or have a hard drive mailed to you. Pricing for Backblaze is a flat $50/year (or $5/month) for one computer with unlimited data. This is the cheapest way to get unlimited backup data for one computer, hands-down! If you tack a ton of photos in RAW format or have hours of home videos you’ve digitized, unlimited is the way to go. It’s the best bang for your buck – Backblaze is the cheapest way to get unlimited data and files on a per computer basis. There are no caps on file size for uploads. You can backup external hard drives that connect to your computers as well. The “Rapid Restore” hard drive option is available because if you have to restore all your data to a new computer, it’s much faster to do it from an external hard drive than over an internet connection. You might not think you need that, but you never know! Plus, you can even get your money back for the cost of that hard drive if you return it within a month. You pay per computer device, which might be more expensive if you have lots of devices that don’t all need unlimited storage space. However, recognize that total storage space on other plans can add up really fast for multiple devices, so if one of your hard drives is full of pictures, Backblaze might still be the way to go. Backblaze is a cloud backup service not a cloud storage service. It’s not a true archiving service – meaning, Backblaze doesn’t save deleted files past 30 days. So if you delete something off your home computer and don’t realize it until months later, that file won’t be on your Backblaze backup either. However, I usually figure out pretty quickly when I’ve accidentally deleted something, so 30 days has been sufficient for me. –> Click here to start backing up with Backblaze. iDrive is another long-term online backup option, and it caters to households with multiple devices. Since your photos are stored in the cloud, you can access them from a web browser, computer, or mobile device. The pricing structure for iDrive is different than their competitors, so it might be more cost-effective for you if you have multiple computers in your home. iDrive pricing is based on how much space you use across devices, so you don’t pay per device like Backblaze or Carbonite. This works well if you have multiple computers that need backing up, and none of them have huge drives full of pictures/videos. If you have anything less than 2TB total, it’s 69.50/per year, although they often run a promotion for your first year to be closer to $52. iDrive is the most generous limited backup plans I’ve seen! Their higher plan is 5TB is less than $100 per year – which makes it pretty comparable to Backblaze on two computers. It’s up to you. You can get have multiple computers on one account – so this could be cheaper for you if you had several machines in your home. External hard drives can be backed up as well. iDrive continuously and automatically backs things up behind the scenes. iDrive is a true archival service, meaning that once information is backed up to your account it is never deleted from iDrive, even if you delete it off your original computer. This means if you don’t realize you’ve deleted something until much later, it will still be on your iDrive cloud backup account. You can give iDrive access to your Facebook and Instagram, and it can backup files you’ve posted there, including ones you’re tagged in. That’s a unique feature (although honestly, you probably don’t delete the photo off your computer if you liked it enough to post, so this might be unnecessary). You can eliminate the long initial upload time w ith their iDrive Express program. They ship you a hard drive, you load it with your initial backup data, and then you ship it back. This is way faster than trying to upload TB of photos over your internet connection! This service is free once a year. Limited-size cloud backup like this is only cost-effective to a point. It depends on how much data you have on how many computers – you’ll have to do the math yourself to see if it’s worth it to you. Don’t forget to consider the rate at which you create more files that need to be backed up. It might seem cost-effective now, but will it if you have even more family videos to store in a year? You can’t back up large files over the web – you need to use the desktop application for big files. If you delete a bunch of stuff off your computer, it will still be saved in your iDrive account unless you manually remove it. This is usually a good thing, but if you’re worried about space, remember that you’re still paying for the space it takes to store files you’ve already deleted. –> Click here to go to iDrive and get started. Carbonite is another well know online cloud backup service that automatically saves a copy of your files, and you get unlimited files and space. It’s very similar to Backblaze, and might work for you. Carbonite offers unlimited data backup on every plan. The basic plan is $59.99/year. If you want the ability to backup hard drives that you plug into your computer, then you need the Personal Plus $99.99/year. If you want a hard drive copy of your data mailed to you for a faster restore if you lost everything, then you need the Personal Prime $149.99/year. I don’t love this model because it’s hard to decide what options you will want in the hypothetical event that something should happen. (And for reference, all the features in the most expensive $149/year Carbonite plan are already included in the flat $50/year Backblaze plan). Unlimited data and files can be stored, at a very comparable price for the Basic plan. You can view and access your files from any browser or the Carbonite Mobile app. All user data is not backed up by default in the Basic plan. I know you can change this in the settings, but what if you didn’t know that? For instance, video files are not automatically included in Carbonite backups, because they are bigger than 4G. This blows my mind! Protecting home videos is exactly what backup should be for, but they aren’t automatically included? I like my backups to be as fool-proof as possible, so this is a negative for Carbonite. You pay per computer, which could get expensive if you have several devices that need to be backed up. You can’t back up external hard drives connected to your computer on the cheapest plan – you have to pay for the $99/year plan to get this option. Like Backblaze, Carbonite is a cloud backup service not a cloud storage service. Anything you delete off your computer will be removed off their servers as well (after 30 days). So you’re out of luck if you don’t realize you deleted something more than a month ago. –> Click here to go to Carbonite and get started on your cloud backup. Nope. Dropbox is not enough. Unless you’re putting every single file in it, you’ll lose whatever documents/pictures/videos you store on your desktop computer. I love Dropbox and use it daily, but I can’t put thousands of photos/videos in it, both for size upload restrictions and how expensive that would get for years worth of data. In general, syncing services are excellent at what they are meant for: sharing files across devices. However, the fact that they are manual systems, where you pick and choose the files you upload, means that they are not a reliable system for true backups. An automatic cloud backup works because is it is not dependent on human fallacy – even if you forget to save files on an external hard drive, it will back them up for you. Read this post for the difference between cloud backup and cloud syncing, and what services I recommend. Pin this if you thought this was helpful! COMMENT: So tell me – what service have you chose to use to backup your precious family photos?